As Part Of The Pure White Collection, This Corner Shelf Brings A Fresh Perspective To Desk Accessories By Offering Functional Solutions With Appealing Design Elements. Create More Useful Space And Use The Three Shelves For Storing Papers, Books And Folders. The Unit Is Reversible For Corners On The Left And Right And Can Also Be Placed Upright To Hold Oversized Binders And Catalogs. Corner Shelf Features Sturdy, 7.4 Lb. Wood Construction With A Durable, Double-Coated, White Finish. Nonslip Rubber Feet Reduce Movement And Protect Your Worksurface From Scratches And Scuffs. Stylish Design Makes A Great Addition To Any Desk. 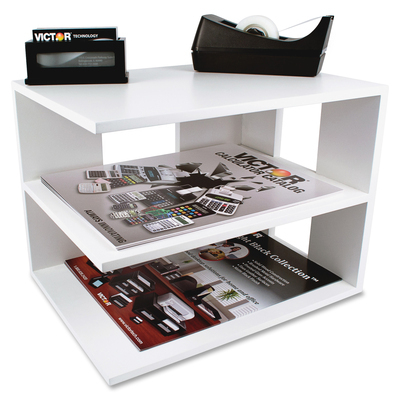 Corner Shelf Is Perfect For Use Either At Home Or In The Office. More From The Manufacturer.